Peters Canyon Regional Park offs great hiking in Orange County. Ashley and I recently had a chance to visit Peters Canyon Regional Park, which is a great day hiking location in the heart of Orange County. This park, even though it is surround by homes in some spots, packs a punch. It offers great views to those who hike here as well as the opportunity to see abundant local wildlife. 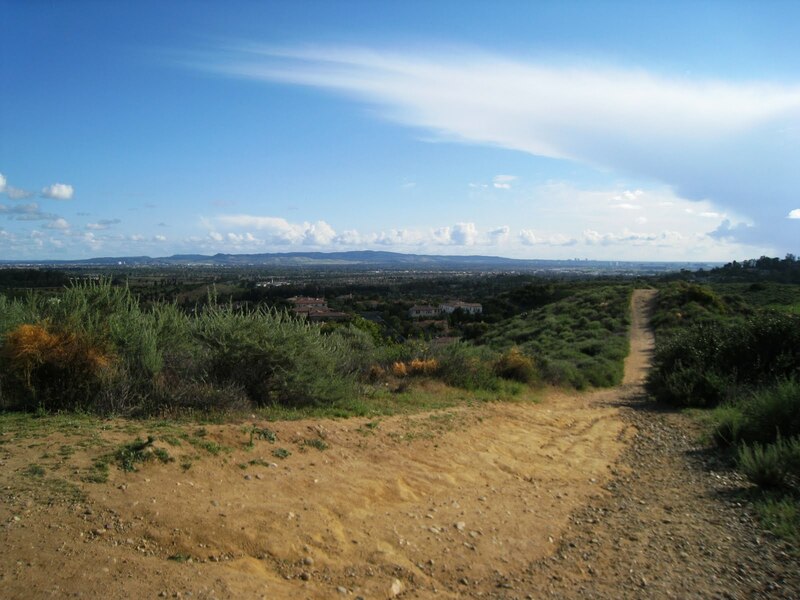 Peters Canyon Regional Park is a great place to hike at and offers hiking trails in Orange County that the whole family will enjoying doing together. For more pictures of this hike check out our Facebook Page. Directions to Trailhead: To get to Peters Canyon Regional Park, from the 5 freeway, exit at Jamboree Road. You will want to head East and go through the Tustin Market place. You will be on Jamboree for a little over 5 miles and you will make a left onto Canyon View. There will also be signage at Canyon View indicating the turn for Peters Canyon Regional Park. 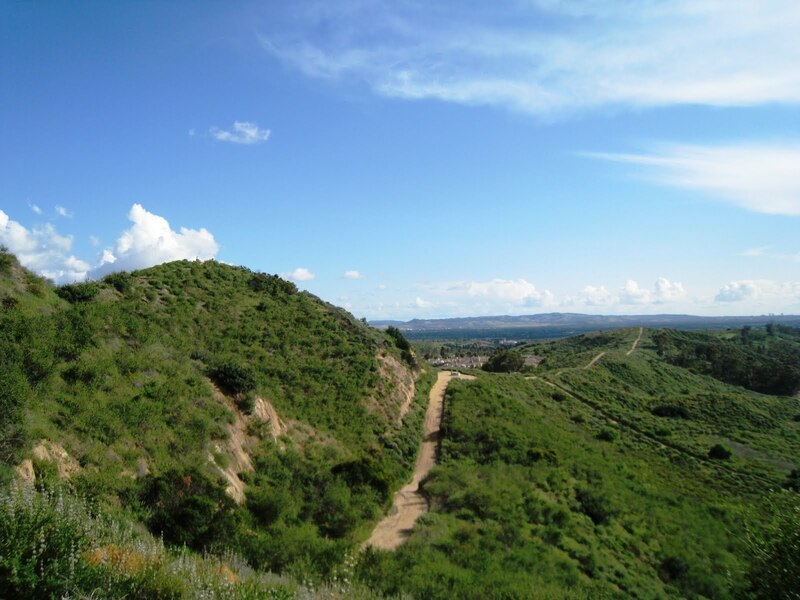 After the turn onto Canyon View, the entrance to Peters Canyon Regional Park is located on your left. Parking at Peters Canyon Regional Park costs 3 dollars. The park is open daily from 7a.m. to sunset, 7 days a week. The park is closed for roughly three days following rain and/or hazardous conditions. We have provided a Google map below of the park, for an additional map click Here. 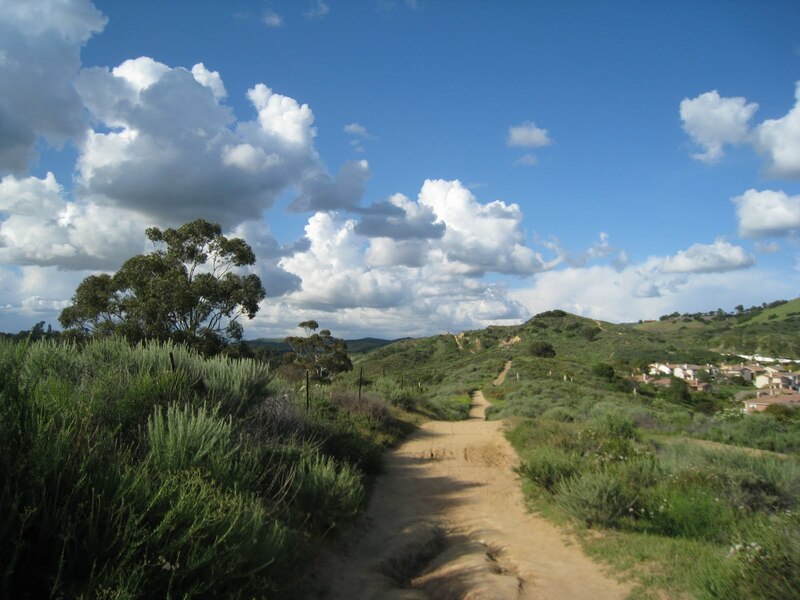 Description of Hike: Peters Canyon Regional Park has just over 6 miles of trails going through this OC Park. The trails are well maintained by the people at O.C. Parks and are well marked so you know which trail you are on. Ashley and I did a 4.5 mile loop of Peters Canyon Regional Park. This included a loop around the Peters Canyon Reservoir, located in the upper portion of the park, in addition to a loop around the canyon portion of Peters Canyon Regional Park. The hike we did had roughly 500 feet of elevation gain to it. 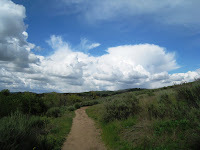 We took the Lake View Trail, to the Cactus Point Trail, back to the Lake View Trail, to the East Ridge Trail, to the Scout Hill Trail, to the Creek Trail, to the Peters Canyon Trail, back to the Lake View Trail. 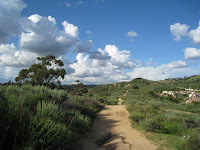 Maps of the hiking trails at Peters Canyon Regional Park are available at the trailhead. Sections of the East Ridge Trail, especially the first portion closest to the reservoir, are pretty steep and will give you a good workout. If you are looking to do a shorter loop, the Lake View Trail which goes around Peters Canyon Regional Park's Reservoir is a 2.5 mile loop with less elevation gain that the one we did. 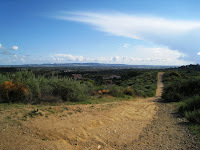 A printable map of the hiking trails at Peters Canyon Regional Park can be found Here. The park brochure for Peters Canyon Regional Park can be found Here. Further Thoughts: Ashley and I really enjoyed our time at Peters Canyon Regional Park. The beginning portions of the hike were close to some of the roads near the park entrance, but after that initial setting things at this park were amazing and at times felt like you were deep in the wilderness. Portions along the hike offer great views of the Angeles National Forest, Saddleback Mountain, the greater Orange County area, and a large portion of the Santa Ana Mountains. 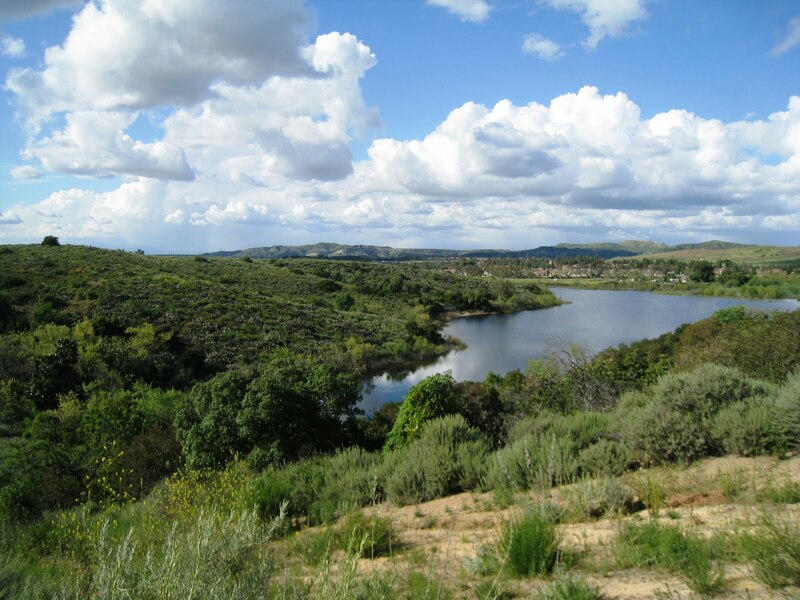 The views coupled with the full reservoir during wet year in Southern California offered amazing sights to see.When we hiked at Peters Canyon Regional Park, everything at this park was green since we visited during the rainy season in Southern California. Bottom-line is the hike offers amazing views and the best time to visit this park is during the Fall, Winter, or Spring. If you visit during the summer make sure to bring sunscreen, a good hat, and plenty of water as shade is lacking along some of the trails. 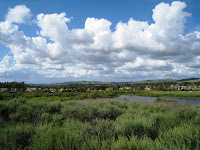 One of the amazing things Peters Canyon Regional Park offers is the chance to see local Orange County wildlife. While were were hiking here we saw a coyote in the process of hunting one of the rabbits at the park. 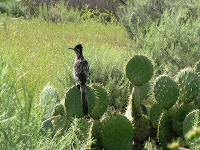 We also observed a male and female road runner, who were likely near their nest. It was neat to sit back and listen to them talk to one another. We also saw a number of hawks and turkey vultures flying overhead. In addition to this, while walking on the creek trail it was neat to hear and see some of the frogs at Peters Canyon Regional Park. The official Peters Canyon Regional Park website states the following on wildlife. The wildlife population includes mule deer, bobcats, coyotes, opossums, raccoons and an occasional mountain lion. Many smaller amphibians, mammals and reptiles abound, attracted by the lure of Peters Canyon Reservoir and Creek. Cactus wrens, gnatcatchers and rufous-crowned sparrows may be found in the park's coastal sage scrub and grassland communities. The eucalyptus groves are home to Cooper's, red-tail and red-shouldered hawks that can be seen patrolling the skies for unwary prey. Ashley and both doubt that many deer frequent the park because access to the park would be difficult for them given the surrounding residential developments and we didn't see any deer tracks at the park. However, we still would not be surprised to see one at this park. This park does have some interesting history. During World War II, Peters Canyon Regional Park was used as a training area for the U.S. Army. "Camp Commander," as it was known, was established in the eucalyptus groves near Little Peters Lake, or what is known today as Lower Peters Canyon Retarding Basin. Mock battles were staged between Camp Commander and "Camp Rathke," an Army post two miles away in Irvine Regional Park. 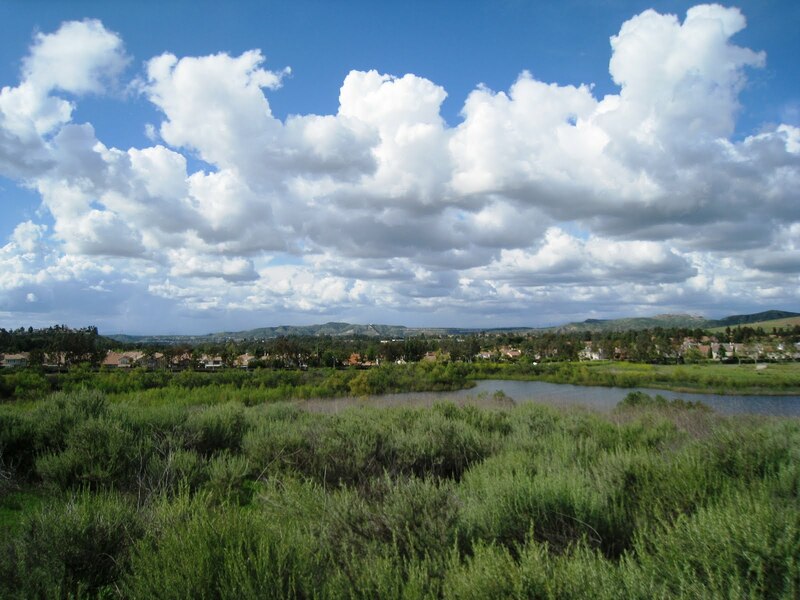 On March 3, 1992, the Irvine Company dedicated 354 acres of Peters Canyon to the County of Orange to be preserved as open space. 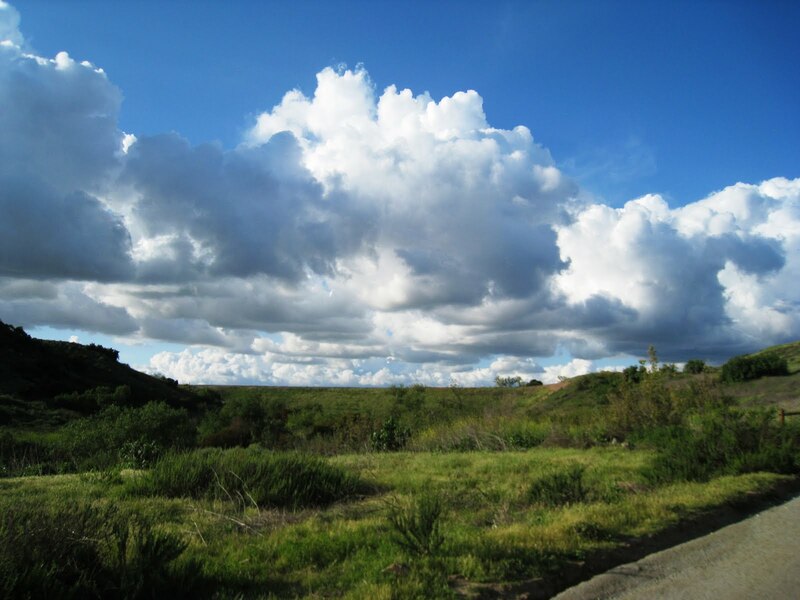 This land was turned into the beautiful Peters Canyon Regional Park that exists today. This is a great Orange County Hike and both Ashley and I would both recommend this hike to others who are looking to get out and explore some of the wilderness areas in Orange County. This is a very popular park and you will likely see other hikers and locals from the surrounding neighborhood out enjoying Peters Canyon Regional Park. Rating: Elevation Gain: 500 ft. (Easy), Distance: 4.5 Miles Roundtrip (Easy - Moderate). Time to Complete Hike: 2 - 3 hours. Looks like a great park. The clouds in those first pictures are amazing and I love how green everything is. We need rain in Texas something bad! Great pictures, guys! I did this one today with my dog... we enjoyed ourselves, even though we didn't get to see any critters. This was a great hike and nice work out. Enjoy checking out all your hikes.